An SUV is a great, versatile vehicle for families who love to spend time in the great outdoors. These vehicles typically have plenty of room for the entire family and their luggage, but adding a bicycle or two or three to the mix may pose a problem. If your family is fond of biking and want to go on cycling adventures that stretch further than a few blocks from your home, it might be time to start looking for a bike rack for your SUV. A wide variety of bike racks exists, in all kinds of shapes, capacities, and designs. However, not all of them are suitable for SUVs, and even the ones that are, might not fit your specific vehicle. Before purchasing an SUV bike rack, it is very important to weigh all of your options and to know the pros and the cons of each model. 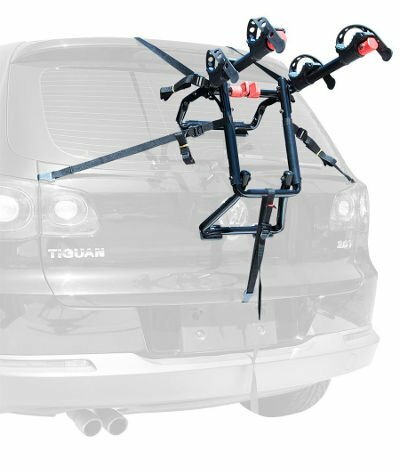 Our favorite SUV bike rack manufacturers include Thule, Allen, Yakima, and Swagman. 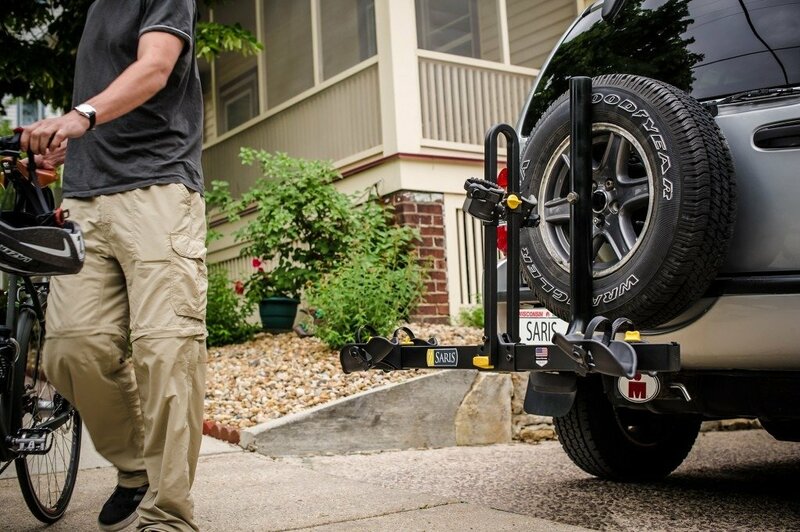 If you are looking for something that requires less muscle power, from you to load and offload the bikes, an SUV hitch mount rack might just be the solution for you. That is if you don’t have a Jeep or one of the other types of SUVs that have the spare tire mounted at the rear. Most vehicles come with a hitch mount, but you need to figure out what class your hitch belongs to, to ensure you get the right fit. Hitch mount bike racks come in a huge variety shapes, styles, and sizes and can carry anything from 2 to 5 bikes at a time, depending on the design. Although they are not as multipurpose as a roof rack, hitch mount bike racks for SUVs will keep the bicycles out of the wind, so your vehicle will be more aerodynamic and consume less gas. Hitch receivers come in two main sizes, the 1 ¼ inch and 2-inch size, with the mounts simply sliding into these receivers. They also come with all kinds of solutions to keep the SUV rear door accessible, with swing, tilt or fold up options. Bikes will either be held in place with Velcro straps, trays or a vertical staff. Hitch mounts are arguably the most popular way to fit a bike rack to a vehicle at the moment. There’s a good reason for this as you are working from a very sturdy stable platform and the number of options and ease of access really works in favor of this configuration. 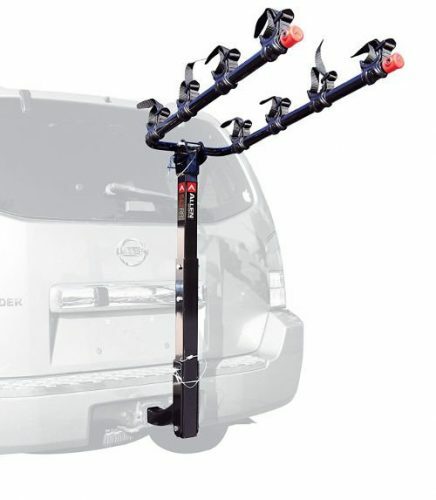 Our pick for an SUV hitch mounted bike rack is the Allen Sports Deluxe 4-Bike Hitch Mount Rack. There are 2 and 5 bike models available as well but this is the most popular model. Your vehicle will need to be fitted with a 2-inch trailer hitch – we suggest you get a Class III or IV hitch professionally installed if you do not have one already. The carrying arm protrudes 22 inches and is fitted with a tie-down system to secure each bike individually. The arms can drop out o the way when no bikes are fitted or make storage easier. 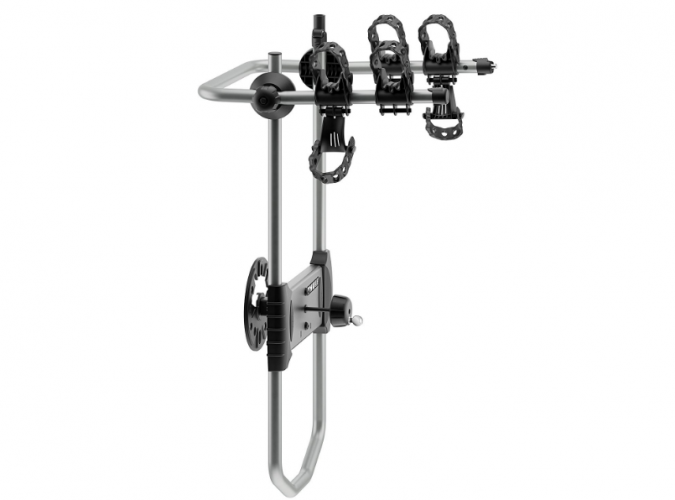 The initial setup and assembly of the rack are pretty easy and simple – as simple as you could expect from any hitch-mounted rack really – and once in place, fitting the bikes and transporting them safely is a breeze. Removing the rack from the hitch is simple enough with a single pin. The Allen Sports Deluxe is made from steel (so they do weigh a bit more) but combined with a classy black powder coating and Allen’s lifetime warranty you have a high-quality piece of equipment that will last for many years. Take note that there are two 4-bike models in Allen’s Sports Deluxe series; the Model 542RR and the Model S545 Both these racks carry 4 bikes and up to 140lbs. The S545 has a few extra features which include quick fold carry arms, quick secure straps & dual compound cradles, a rapid tilt-away mast and a dual compound spine shield. 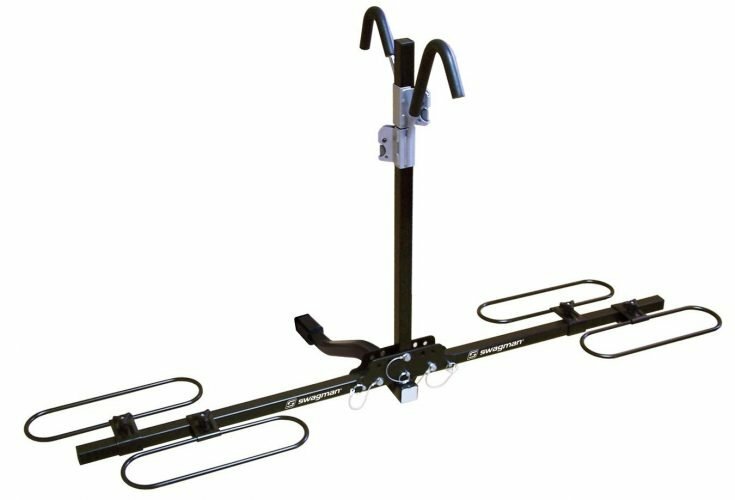 We’re not convinced the additional utility justify the price difference, so we’d suggest you buy the standard 542RR model, but if you do look at it and feel it’s missing any of those features the Allen Sports Premier Hitch Mounted 4-Bike Carrier S545 may be the answer. This stylish rack is exceptionally easy to fit and can even accommodate fat tires; you’ll simply have to purchase an extra tray. The standard rack will take tires between 20’ and 29’. The rack fits onto a 1 ¼ hitch receiver or a 2”; making it possible to use it or more than one SUV; handy if you have two or a friend needs to borrow it. Once in place, there is a ½ inch locking pin to help ensure the rack can’t go missing. Again this is sold separately with a 10mm cable. Of course, if you only ever take your bikes somewhere to use them then you may not feel this is necessary. The rack can handle a total of 70lbs; that’s 35lbs per bike which should be enough to keep most people happy. More important is the fact that it has a built-in anti-wobble device. This helps to keep your bikes balanced and the vehicle handling properly while you drive. It is worth noting that the center arm of this rack can be folded down; allowing access to your boot while the rack is in place. As well as the tire size you need to consider how big a frame this rack can accommodate. Fortunately, it comes with upright arms that have built-in ratchets; allowing you to adjust them to fit the frame of your bike. The maximum height of the frame of your bike is 59cm. The Swagman XC Cross country 2-Bike rack is made from steel and weighs 32 pounds. When you’re not using it you can fold it up vertically to minimize the space it takes up at home or on the back of your vehicle. Just don’t forget it’s there when you’re reversing! It is worth noting that the bikes are secured by their wheels and then the ratchet is closed over the top; ensuring they cannot move while you are driving. You can even slide the wheel plates to accommodate different size frames. It doesn’t matter if you have a road bike, downhill, full suspension or a BX; this rack can handle it and make sure it gets where it needs to. 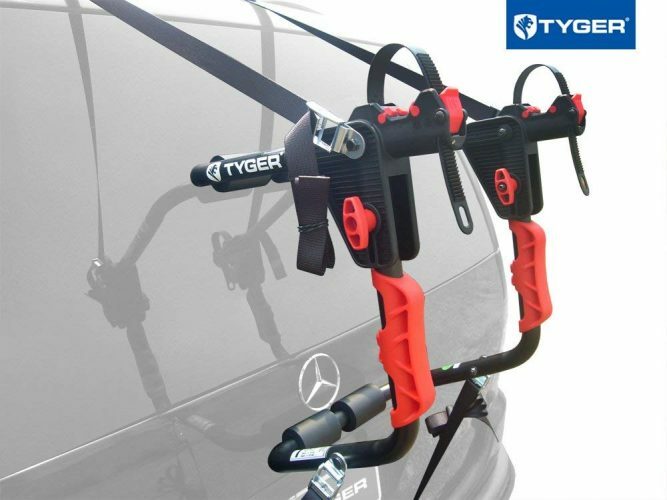 If you’re looking to carry 4 bikes in one go then this could be the perfect hitch mounted carrier for you. The racks sit on your toe bar and come upward to provide the support for all 4 bikes. This can be easily swung to the side providing full access to the boot of your vehicle. While this is great for any type of vehicle it is particularly useful for an SUV where your big boot door opens sideways. A great feature of this rack is not the fact that it fits in pace with just a single bolt; although that is good. It’s actually the fact there is a speed knob, allowing you to adjust the rack without a tool. In terms of security, it is recommended that you purchase a Yakima handcuff lock; this will allow you to secure the bikes to your rack and be confident that will all still be there; no matter how long you leave your vehicle for. Your bikes are held in place on the rack by ZipStrips. These are very easy to add and lock to the mount and your bike. When you add in the anti-sway cradles that the bikes sit in you’ll be confident that your bikes are not only secure but are unable to crash into each other on the journey. The mounts are even padded to ensure your bike is safe. A really nice touch by Yakima is the limited lifetime warranty. This covers the rack against anything that is not normal wear and tear; for the lifetime of the first owner. The rack measures 26 x 18 x 44 inches and weighs 56 pounds. It is designed to handle weight up to 150 pounds; that’s 37.5 pounds per bike. It is worth noting that to release this rack and move it to the side you simply need to turn the speed knob and then release the pin. This release pin is 6.25 inches from the locking pin; you’ll need at least that much clearance to fit this to your vehicle. If you don’t have this much you may not be able to lock the handle into position and insert the pin. The speedy knob is a great idea but many users have commented on the need to rock the rack side to side as you tighten it up; this will ensure it is really tight and cannot move in transit. You can also pull a lever on the top to fold the top arms away; helping to keep its profile to a minimum when the bike rack is not in use. If you don’t have a hitch receiver on your vehicle and don’t want to carry bikes on the roof, a trunk rack is a simple solution. They are usually very easy to install and don’t require many accessories to make them work for different bike frames. Trunk style racks are also usually very lightweight, making it easy to use on different vehicles in one family, but they can typically only carry one or two bikes at a time and have a weight limit. These racks are definitely a better solution for a sedan or hatchback than an SUV. Most trunk mounts only use cables or nylon straps with hooks, so security against theft may be a concern. You will also not be able to access the rear door with the rack installed. Also, be sure to gather some feedback from friends or online sources and look for a design that will not damage the paint on your car. While most trunk bike racks are designed in a way that mitigates this potential hazard, you can, unfortunately, get an unhappy surprise in the form of small scratches or even dents to your trunk if not careful. We’re not going to lie, we’re not the biggest fans of trunk mount racks – something about all those straps and hooks to the car that just feels weird – but we’re very willing to admit that that’s a personal preference and there are some very well-designed and easy to use trunk mount bike racks for your SUV in the market. We suggest you look at the Allen Sports Premier 2-Bike Trunk Rack. While you do find 4 bike trunk mounts on the market the sheer nature of this mount actually dictates that most trunk mount systems are designed to carry 2 bikes or less, and that makes sense. 4 Bikes on a single rack present quite a weight and we suggest you look at a hitch mount system if you need to carry more bikes. Allen Sports Premier 2-Bike Trunk Rack fits most all sedans, hatchbacks, minivans and SUV’s. They come with Allen’s patented quick snap set-up system which makes it easy to do your in initial fitting and getting the rack onto the vehicle. On this rack, the arms are 12 inches long and can accommodate 2 bikes at a combined 70 lbs. The bikes are held in place by Allen’s dual compound tie-down cradles and once fitted you can rest assured that your bike will be secure and safe on the back of your vehicle. Take the necessary precautions to ensure the 2 bikes do not bump into each other if you’re going to go onto backroads or gravel roads. The rack also sports some extra large car pads to ensure the rack doesn’t cause any paint damage where it touches the vehicle. Our suggestions would be that you consider a strap mount system if you have a single bike to transport – they are relatively easy to fit and the lightweight compliments this design. 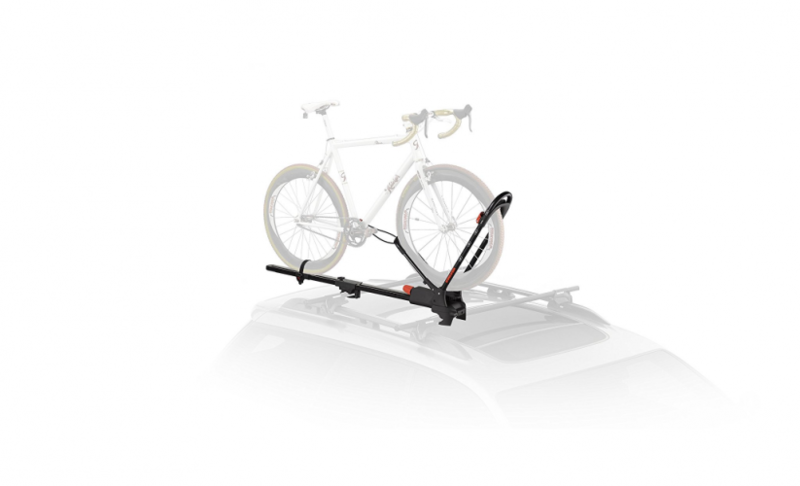 For that, look at the Allen Sports Ultra Compact Folding 1-Bike Trunk Mount Rack. This small rack is designed to carry just 1 bike; making it the perfect option if you’re planning on completing a sole ride or just meeting some friends. It’s not the best option if you’re ready to start family cycling holidays! The rack is designed to be secured to the boot of your vehicle. It should fit any sedan, hatchback, minivan and, of course, SUV’s. However, it is not designed to be used if your car has a rear spoiler. The rack is exceptionally sturdy and has been well designed. There is padding on the lower part of the frame to protect your car from the rack as you pull the ratchet straps tight. These are what hold the rack in position. There is also safety straps included to help secure the bike and keep it in position. The rack is well designed, it is powder coated black to protect it from the elements; this should stop it from rusting. Even the part that the bike sits on and against has padding to protect your bike from harm. The rack itself is padded with soft cradles to ensure your bike is well looked after in transit. The arms fold into the main body when not in use. This is designed for convenient storage and carrying when the rack is off the vehicle. However, it is also possible to tie these arms to the main rack whilst it is on your vehicle; minimizing the risk of damaging it when it’s not in use. There are plenty of instructions with the rack to ensure you can have it fitted to your SUV in minutes. No assembly is required and it comes with a lifetime warranty for the first owner. But, do not try to fit this rack to motorhomes or a trailer. The rack itself weighs just 8.9 pounds and measures 20 x 15x 9 inches. But, although incredibly easy to install you won’t be able to open your boot without removing the rack. While this won’t be an issue in many situations there are times when you can find this a serious inconvenience! This is a stylish looking, streamline rack. However, the rack is still limited to approximately 35 pounds. This is enough to handle most bikes but not much use if you have something a bit heavier. The real issue is that the springs which allow the arms to fold in are not as big as they could be. This is why some users have reported their bikes falling off as the tiny springs fail. If your SUV carries the spare tire at the back and you only need to carry one or two bikes at a time, a spare tire bike rack might be a good solution. Most spare tire racks can carry only two bicycles at a time and are easy to install. Just like the trunk bike racks, spare tire racks also strap onto the back wheel and are light, compact and easy to store. Chances are your spare tire tilts away before you can access your car from the rear or in some cases the tire is attached to your rear door. Some spare tire bike racks are actually designed to allow you easy access to the rear of your vehicle even with the bike mounted. This is pretty important. Be sure to test or evaluate and potential tire rack purchase with your specific vehicle. Besides being able to access the car make sure the bike will not scratch or damage other unexpected parts of the cars when swung open while mounted. There are some good reasons to choose an emergency wheel mounted bike rack though. While fitting the mounting plate of a spare tire mounted SUV bike rack is oftentimes more challenging than some of the other mount options, once that is done attaching the rack is very simple. 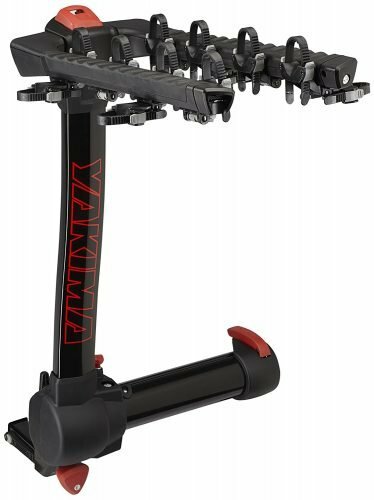 The Yakima SpareRide sports a universal mounting plate and comes with a handy extension so it fits most spare tire lug patterns on the market. It fits nearly any size spare, including oversized truck tires. Also included is a tool-free locking knob to make fitting the rack to the base plate a total breeze. The cradles on the Yakima have a really nice anti-sway design which ensures minimum movement of the bikes when mounted. We really like the cradle design on this bike rack. Finally, just too totally knock it out of the park, there’s a signature Yakima bottle opener on the rack… yes, you read that right, a bottle opener! Go buy it. As you can see Allen is one of the best names in the bike rack industry. This is partly because they have spent years perfecting the art of the perfect bike rack. The Sports Deluxe 3 is designed to handle 3 bikes and mount onto your spare tire. This technique means it is very easy to install but can only be used by SUV’s and some mini-vans; you need a rear tire to mount the rack onto! If you have a rear mounted spare tire this rack should fit onto it. One of the best features of this rack is that the bikes have a lot of ground clearance; in effect drastically reducing the likelihood of your bikes getting damaged while in transit. On top of this, the rack features a patented tie-down system which ensures your bikes are well secured and protected at the same time. The rack weighs just 10 pounds, nearly the lightest one on this list! It is 9 x 6 x 3 inches making it very discreet despite being able to take 3 bikes. The rack is designed to slip over the top of your spare tire. The weight of the bikes holds it against your spare tire preventing the rack from falling off. The bikes are then lifted onto the arms and dropped into the clips provided; two for each frame. These clips are adjustable to ensure a snug fit around the frame of your bike. Of course, there are straps that come from the bottom of the rack that needs to be secured to the vehicle. These will prevent the trunk from being opened while the rack is in place. It is possible to secure these to the trunk itself if you prefer. This should then allow you to open and close the trunk as usual. Although this is designed to fit the spare wheel on your SUV it is worth noting that a tire 255 x 10 is about the maximum width that this rack can handle. The rack can handle 3 bikes at 35 pounds each; that should be enough for your needs. The rack can be secured to your spare tire with a chain lock; this can also go round your bike to deter thieves. You can also unclip the rods each side to allow the rack to fold up; you will need to tie it into place. Alternatively, you can remove it and pop it inside your trunk; it should only take you a few seconds. The rack is designed to clip onto your frame, this means that it can take virtually any size bike and still keep them off the ground. That makes it one of the best options for your family trips! Thule have been making bike racks and rooftop boxes for many years and their expertise shows in the way they put this rack together. The 963 PRO has cages to hold the frames of the bikes; these are designed to be anti sway; preventing your bike or bikes from moving and banging into each other as you drive. This rack is designed to hook onto your spare tire but, unlike the offering from Allen, it can be used on any size wheel. This is because it doesn’t hook over the tire. Instead, you install a mounting pylon to the same anchor as the spare wheel. You will need to remove the spare wheel to do this. However, you only have to do this once; you can easily add or remove the rack with the spare wheel in place once the mounting pylon is positioned correctly. Once the pylon is in place the rack simply screws into position with an easy turn knob. The knob has a built-in lock making it very difficult to remove the rack without the key! You will also be pleased to find a locking cable is included; allowing you to lock the bikes to the rack. It is worth noting that any non-conventional frame, such as a woman’s bike, child’s or even a full suspension bike will need a frame adaptor to allow you to slip it on and off the rack. The rack actually folds down when not in use giving it dimensions of just 4 x 18 x 38.5 inches and it weighs 34.4 pounds; you could easily forget it is still on your SUV! You can only carry 2 bikes safely and the maximum load weight is 75 pounds; this is enough for most situations. When opened up the rack measures 24 x 40 x 26. This should be adequate for the two bikes although if you have odd sized or large bikes you may find it a tight squeeze. Of course, the big advantage of this type of bike carrier is that it can be left on and the trunk will still open; whether the bikes are on the rack or not. This is why it is important that it locks into place; once you have taken the ten minutes you need to install it you can have it ready to use anytime you want! In fact, folded up it looks like a pretty stylish addition to your vehicle! You do need to be aware that the rack cannot be fitted over a tire cover; this will need to be removed first. Roof racks are very versatile, and with the right accessories, a roof rack can not only carry bikes but just about any other thing you can think of, from kayaks to cargo boxes. Roof racks are very stable and allow you to carry the bikes out of sight. But a big downside is that SUVs are typically already high-roofed vehicles and require you to lift the bikes over your head. If your name is Chuck Norris, or you look like Arnie in his golden days, you may be able to do it with one hand behind your back, but a roof rack is certainly not for the faint-hearted. This is especially true if you are planning on going on biking trips regularly. Also keep in mind that, with bicycles on the roof, your SUV might not make the height restrictions of many restaurant drive-throughs and parking garages. If your vehicle is already equipped with a roof rack or crossbars, simply getting an adapter for bikes may be a cost-effective solution. You get different types of mounts, some will clamp onto the bike’s front wheel while others hold the bikes upright by their frames. 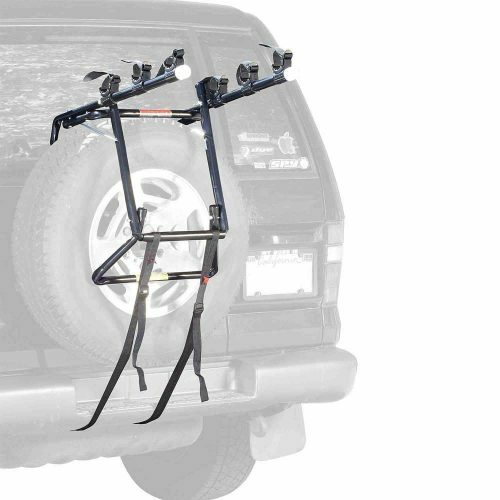 Our choice of roof mounted bike rack for your SUV is the Yakima Forklift Rooftop Bike Mount. Our choice is strongly influenced by its versatility and the quality of the design and construction. It goes without saying that the Forklift fits Yakima round, square, factory and aerodynamic crossbars right out of the box, but what makes it special is that it also fits almost any other brand name car rack systems with round or square bars as well as most factory crossbars that may come with your SUV. Fitting the bike mount to your car roof rack system is a simple and tool-free process. The wheel tray on the rack is easy to adjust which takes the pain out positioning the rear wheel. The Forklift will comfortably hold a mountain bike with 29″ wheels as well as bikes with a longer wheelbase. 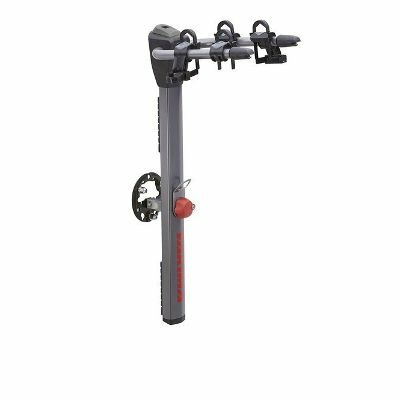 A secure and lockable skewer with integrated adjustment knob for single-handed, easy access holds the bike firmly in place. If your bike has a thru-axle, you will need a thru-axle adapter which can be bought from Yakima or online. The front mount will fit most any disk brake and while some may feel a little tight, it really is hard to find a configuration that cannot be securely mounted on the Yakima Forklift. The design of the Yakima is elegant and simple and even when compared to similar racks like the one by Thule, you’ll quickly come to understand that they’ve minimized the number of parts (for example there’s only a single bolt per clamp, but that’s all that’s needed as opposed to 4 bolts on the Thule) This makes mounting and dismounting the Yakima really easy. Finally, as expected the Yakima Forklift is designed to not touch the painted surfaces of your bike and makes for a great bike mount even for modern carbon bikes. It is important to note that you will need to have roof bars already fitted across your car. This is not the ones that run the length of your vehicle. The Yakima has adjustable clips which lock around your existing roof bars to hold the rack securely in place. These clamps have locks to ensure the rack cannot be removed without the key; although they are sold separately. You will get three keys with the locks to help ensure you always have one to hand when you need it; you don’t want to have to remove the lock without the key! A large section at the front of the bar flicks upwards and forwards while a slightly smaller section comes backward; both come out of the front mount. These create a ‘V’ shape that slots around your front wheel; locking it into place. A smaller clamp goes around the rear wheel holding your bike upright on the roof of your car without touching the frame. This makes sure you won’t damage your bike while carrying it unless you go under a tall bridge! The crossbars on your roof must be between 16 and 48 inches apart, if you can’t do this then you can’t use the Yakima Frontloader to carry a single bike. The rack will take most bikes providing their wheels are between 20’ and 29 inches; this means it’s a no for children’s bikes. Like so many of the other racks on this list there is a comprehensive warranty that covers most things apart from wear and tear but only for the first owner. Although you do need crossbars to mount this roof rack, it is worth noting that you can use any type. Round, square or any mixture in between will all accommodate this stylish rack; it’s certain to get your friends asking questions! Of course, this rack handles just one bike but it is possible to add more of them onto the roof of your SUV. The exact number will depend on the size of your vehicle and the sizes of the bikes; just don’t forget they’re on the roof! The rack arrives in one piece, all you need to do is mount it to your car and lock it into position, (assuming you purchased the locks). It measures 57 x 10 x 9 inches and weighs an amazing 1.6 ounces. Lifting it into position is easy although lifting your bike onto the roof may be harder. If you’re in the market for a bike rack and have an SUV then this guide to the best SUV bike racks should help to highlight the positive qualities of all the different racks available. This is the most obvious starting point. You can’t buy a bike rack for one of two bikes when you need to carry four all the time! Consider the maximum amount of bikes you will need to carry and use that as your guide to choosing the right bike rack. Don’t forget they only go as high as 5! Do You Need To Access The Trunk? If you have an SUV then you can have a hitch rack or a spare tire rack and still get into the trunk. If your bike or bikes are going with you and you’ll also be carrying things in the trunk then you don’t want to have to remove the rack just to access the boot. If you need to access the trunk then choose a rack that will allow you to do so. If in doubt it is better to go with this option! How Often Do You Use The Rack? Do you use your rack every week or every day? If so it will be a permanent fixture on your vehicle and you need one that doesn’t affect your use of the car. IT won’t matter if it is complicated to fit as it will stay in place all the time. However, if this is just for vacations and other occasional use then you need to choose one that s very easy to fit; you won’t be doing it often enough to remember or want to deal with complicated instructions. Most bike racks fold up fairly small. However, if you want to keep it off your SUV then you need to have space at home to store it. If you don’t then it will be staying on the vehicle and, again, you need to select a rack that will allow you to use the trunk and other parts of your vehicle easily. Of course, if the rack stays on your vehicle you need to choose one that folds when not in use; the more aerodynamic it is the better for your fuel consumption. If you often need to carry a roof box for vacations or other reasons then a roof rack for your bike may not be the most sensible solution. It is worth considering how you currently use your vehicle before choosing your bike rack; you don’t want to have to buy a second one for the annual vacation! You must decide how much you are willing to spend on your chosen bike rack before you start looking. There are many great options available that won’t break the bank. However, the more you use you rack the more worthwhile it is spending a little extra on it. All of these factors need to be considered together to ensure you get the very best rack for your needs; even if you have to wait a little while in order for the budget to reach the rack you really want! However, if you choose to go elsewhere then it is important to assess the quality of the product and the reputation of the manufacturer. Social media is a great place to get some honest responses. As always, you need to be aware that there will always be some negative reviews, a good product will have more positive than negative. When looking for an SUV bike rack, you have a lot of options, but your final choice will depend on your vehicle’s design, how many bikes you wish to carry and how often you will transport your bikes. If you and your partner are planning to only go cycling occasionally, a trunk rack or a spare tire SUV bike rack will suffice. 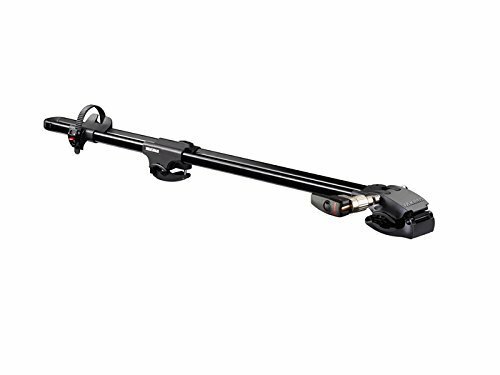 If you and your whole family go biking all the time, often too far away locations, you will probably have to look into a hitch bike rack with adapters for alternative frame bikes. 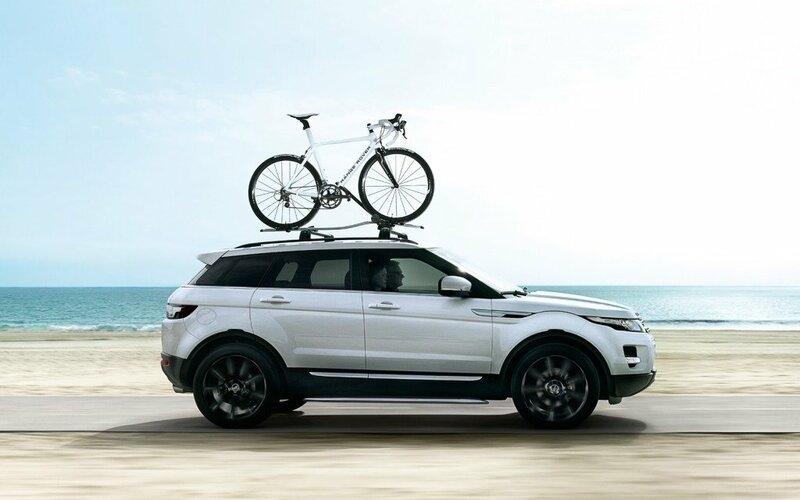 If you don’t need to carry bikes very often but also enjoy other outdoor sports such as kayaking, surfing or skiing, a roof rack is just the thing for you. Whatever you choose, be sure to do some thorough research and read the reviews for the specific product you have in mind. An effective method of doing so is with a spare tire bike rack, which is mounted on to the spare tire of your vehicle.